So. In my last post I said that I was going to explain my blood donation experience. It was good. I had a great time. The whole process took about an hour and a half. But, keep in mind I chose a complicated donation. Whole blood (regular) donation takes anywhere from 45 minutes to an hour total. And you get to save lives! 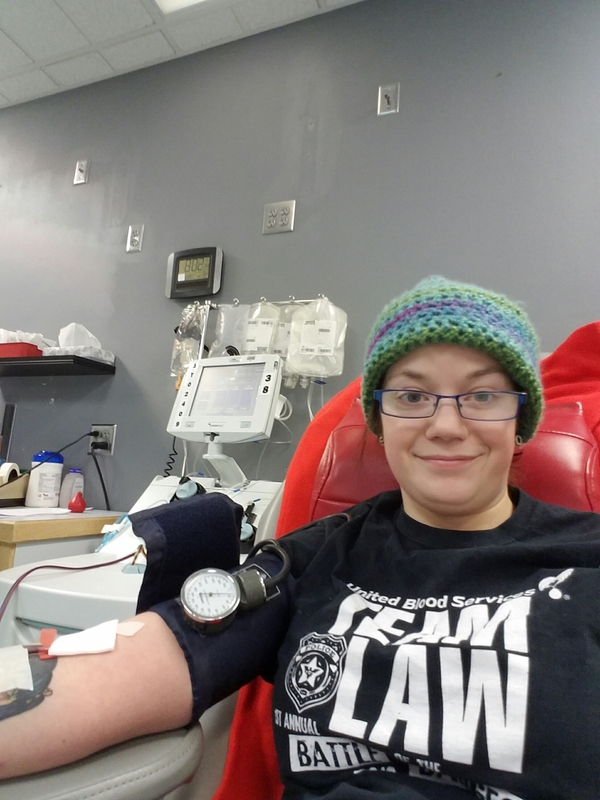 I decided to donate platelets and red cells. My blood type is O-. It’s the universal blood type so my blood can be transfusion into anyone. First is the interview process. This is where they ask you questions about your health history, certain medications, and sexual history. They also get your blood pressure, pulse and temperature. They poke your finger to take a small drop of blood to test iron levels in your blood (to make sure it’s safe for you to donate blood). Then it’s over. Then comes the part most people dread, the actual donation. Don’t look at the photo below if you’re squeamish. Because of the type of donation I decided to do I was using a machine to filter out my platelets and red cells and my plasma was given back to me along with a small amount of anticoagulant. It took about an hour, so while I was sitting there, I played on my phone, watched TV, and chatted with my coworkers. I also got to eat some snacks and drink some pop. It was a great experience. My coworkers are so good. I did have a small reaction. I started feeling like I was going to be sick and eventually I did vomit. But it was because I didn’t eat anything before donating. Learn from my mistakes and eat before you donate. I made it all the way to the end. I waited my 15 minutes in the refreshment area, ate some snacks and drank some pop, and then I went out to lunch with my friend. I was feeling absolutely great after my donation. I know that my platelets and red blood cells are going to help someone who needs them. I think it’s a great privilege to donate my blood. I can save someone’s life. Anyway, that’s it. Happy knitting.